Estimated to be more than 3 billion years old, the lake appears to have covered as much as 80 square miles and was up to 1,500 feet deep — roughly the equivalent of Lake Champlain bordering the United States and Canada, said CU-Boulder Research Associate Gaetano Di Achille, who led the study. The shoreline evidence, found along a broad delta, included a series of alternating ridges and troughs thought to be surviving remnants of beach deposits. A paper on the subject by Di Achille, CU-Boulder Assistant Professor Brian Hynek and CU-Boulder Research Associate Mindi Searls, all of the Laboratory for Atmospheric and Space Physics, has been published online in Geophysical Research Letters, a publication of the American Geophysical Union. Images used for the study were taken by a high-powered camera known as the High Resolution Imaging Science Experiment, or HiRISE. Riding on NASA’s Mars Reconnaissance Orbiter, HiRISE can resolve features on the surface down to one meter in size from its orbit 200 miles above Mars. 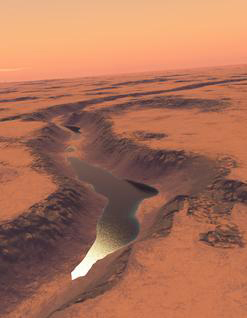 An analysis of the HiRISE images indicate that water carved a 30-mile-long canyon that opened up into a valley, depositing sediment that formed a large delta. This delta and others surrounding the basin imply the existence of a large, long-lived lake, said Hynek, also an assistant professor in CU-Boulder’s geological sciences department. The lake bed is located within a much larger valley known as the Shalbatana Vallis. “Finding shorelines is a Holy Grail of sorts to us,” said Hynek. Planetary scientists think the oldest surfaces on Mars formed during the wet and warm Noachan epoch from about 4.1 billion to 3.7 billion years ago that featured a bombardment of large meteors and extensive flooding. The newly discovered lake is believed to have formed during the Hesperian epoch and postdates the end of the warm and wet period on Mars by 300 million years, according to the study. The deltas adjacent to the lake are of high interest to planetary scientists because deltas on Earth rapidly bury organic carbon and other biomarkers of life, according to Hynek. Most astrobiologists believe any present indications of life on Mars will be discovered in the form of subterranean microorganisms. But in the past, lakes on Mars would have provided cozy surface habitats rich in nutrients for such microbes, Hynek said. The retreat of the lake apparently was rapid enough to prevent the formation of additional, lower shorelines, said Di Achille. The lake probably either evaporated or froze over with the ice slowly turning to water vapor and disappearing during a period of abrupt climate change, according to the study. Di Achille said the newly discovered pristine lake bed and delta deposits would be would be a prime target for a future landing mission to Mars in search of evidence of past life.